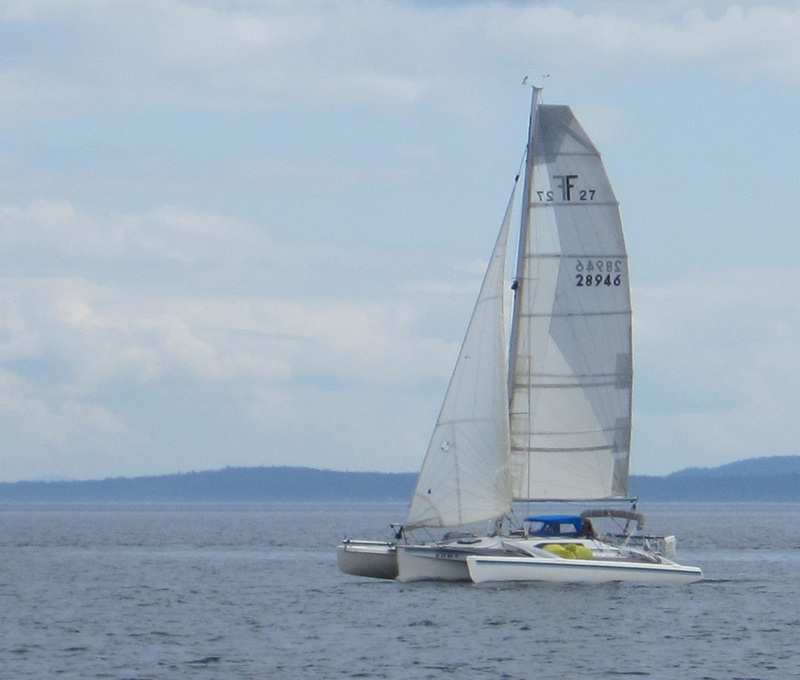 Varakai, 1993 Corsair F-27 Trimaran #323, for sale: $41,900. Located Eugene, Oregon. Varakai is owned by Charlie Magee and Geni Morrow. Contact 541-513-6316 or charliejmagee at gmail dot com. The Photo Gallery is a random collection of shots. We’ll be putting her in the lake in early May and will have a more detailed collection then. She is a fresh-water boat and has never had her bottom painted. She was previously known as “Flying Bye” and the original owners were Tom and Debra Emery of Sacramento, California. 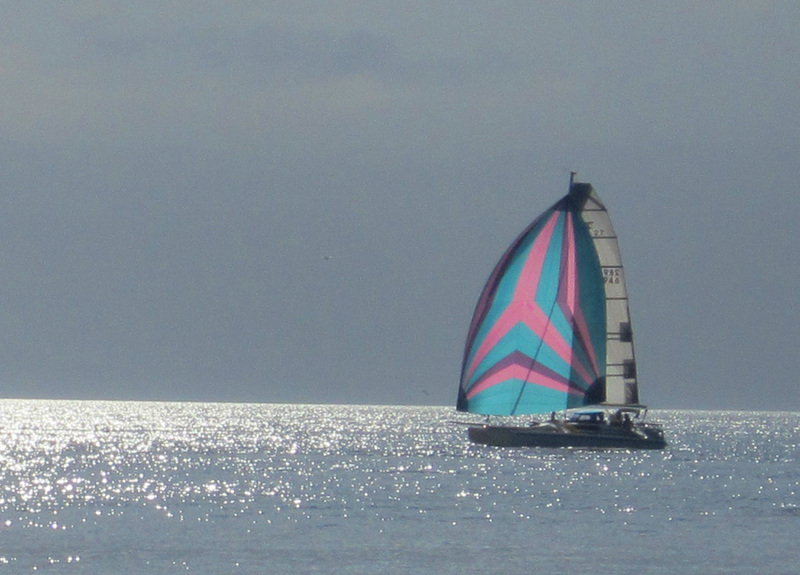 Tom bought her to race on San Francisco Bay and he installed the standard go-fast gear that many F-27s carry: bowsprit, asymm spin, screecher, double-spreader rig, barberhaulers, and aft cabin beam post. She was kept on the hard in Oakland or in their RV garage at home. As the years went by, Flying Bye became more of a cruiser and that brought the addition of a 120w solar panel, hotel-sized minifridge, dodger, bimini, and Autohelm with remote control. That’s the boat Charlie and Geni purchased and renamed Varakai. 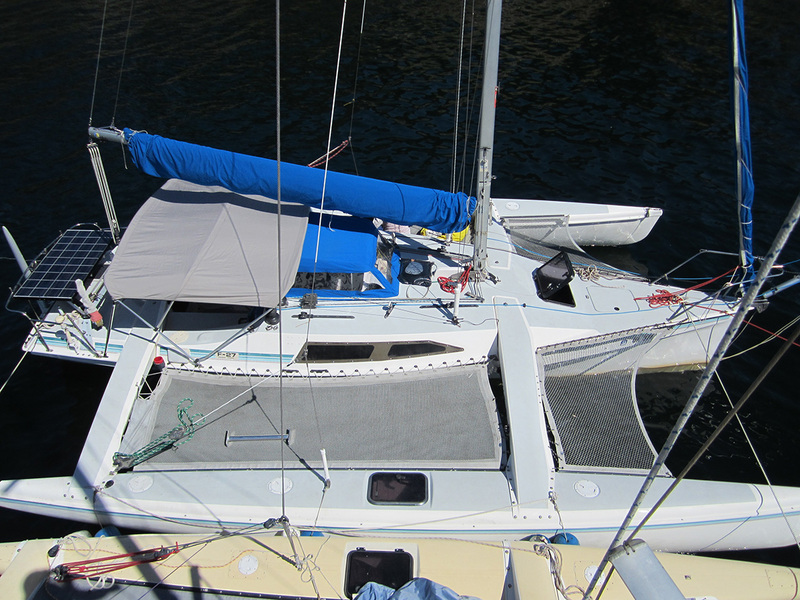 They haven’t had to do much other than sail her and keep her protected from the Oregon winter rains. Charlie raced Varakai occasionally on Fern Ridge Lake, but mostly we cruised her on Fern Ridge, Clear Lake California, and the San Juans. We don’t want to sell her, but the opportunity to be part owners of Malihini, a Shuttleworth cat, was too good to pass up. Smythe square-top main in good to very good condition. Still holds great shape. Bolt-rope has been repaired in several places. Pinhead main: little used, very good condition. 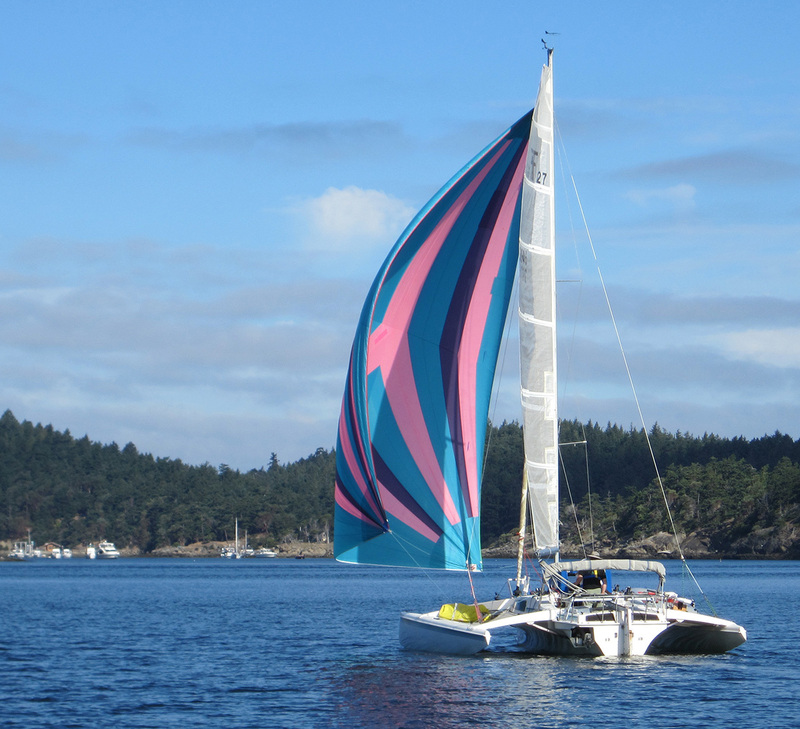 Calvert battened racing jib: very good condition, except luff needs a repair. 120amp solar panel; also has the original solar panel (hiding under the big panel). No idea if it’s generating anything. Icom Radio works great but we accidentally broke the stern mounted antennae while bringing the mast down at the end of a trip. Trailer with disc brakes. Refurbished/tuned 2011.